In this post I will take a look back at a few (well, actually 31) of the satellite images I processed in 2017 (take a look here for the 2018 edition), especially those of them which I believe to be some of the better ones. The images are in no particular order or ranking, I just picked what I liked and what might be interesting to look at. If you click on an image you will get taken to Flickr, where you can explore and download a full-size version of it. 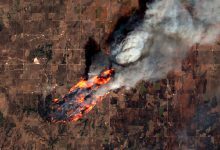 You will find images from different satellites (even an old American spy satellite), but mostly images taken by the European Copernicus Sentinel-2 satellites and the American Landsat 8 satellite. 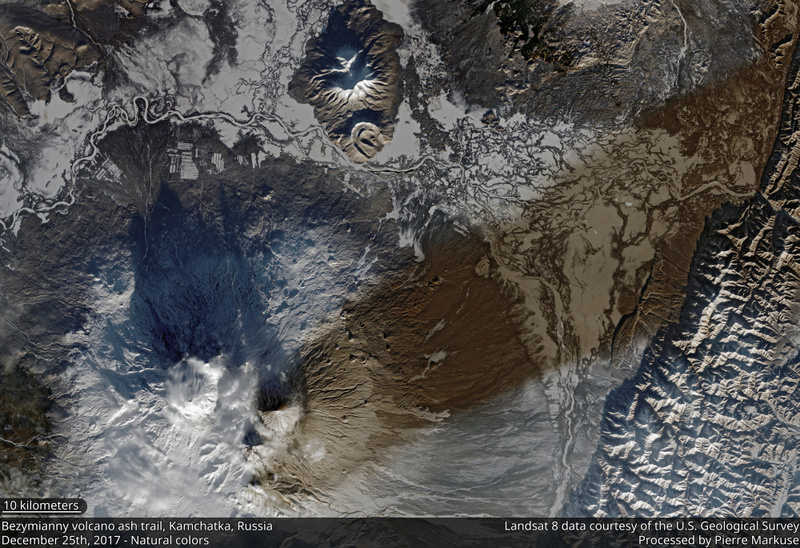 A very recent (December 25th) Landsat 8 image of an ash trail caused by an eruption of the Bezymianny volcano in Kamchatka, Russia. The trail was first discovered in the Landsat data by Nahúm Méndez-Chazarra. You should also read this blog post by Simon Gascoin with a beautiful 3D animation of it. 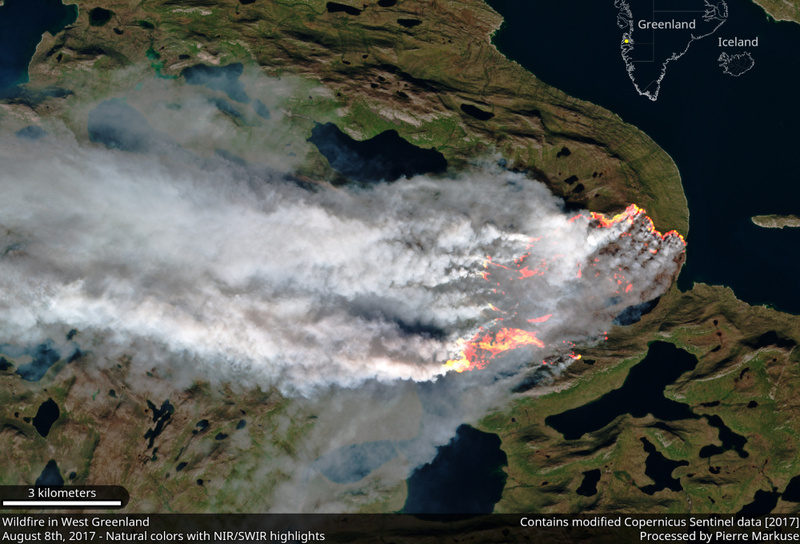 Two Sentinel-2 images of the Greenland wildfire in August. You can find more information and links in this blog post I wrote about it. 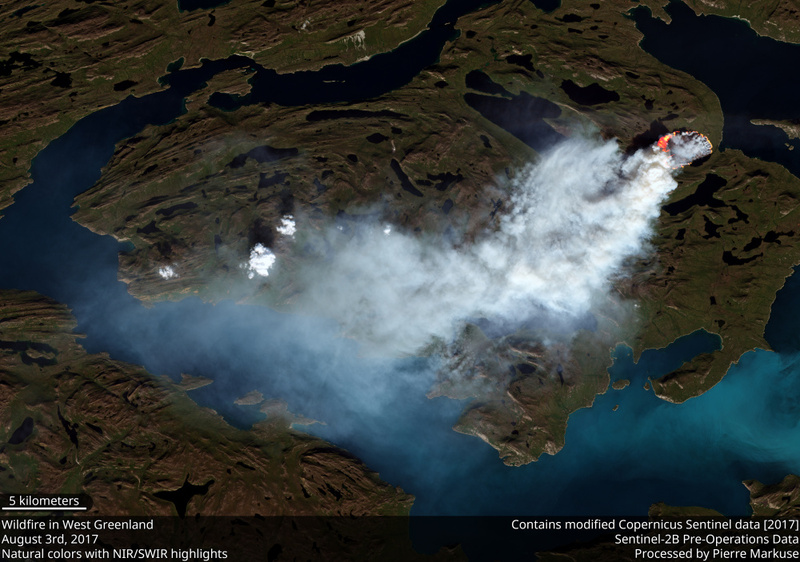 More images of the Greenland wildfire can be found in this album on Flickr. 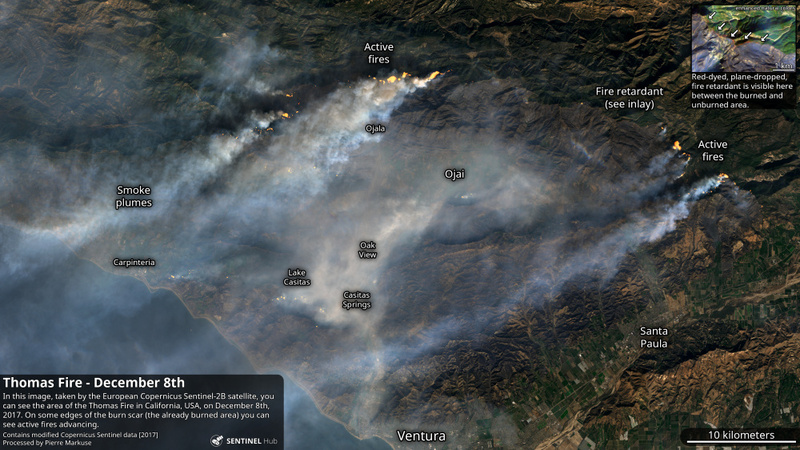 Two images of the massive Thomas Fire smoke plume, the first one taken by Sentinel-3, the second one by Landsat 8. More images of the Thomas Fire can be found in this album on Flickr. 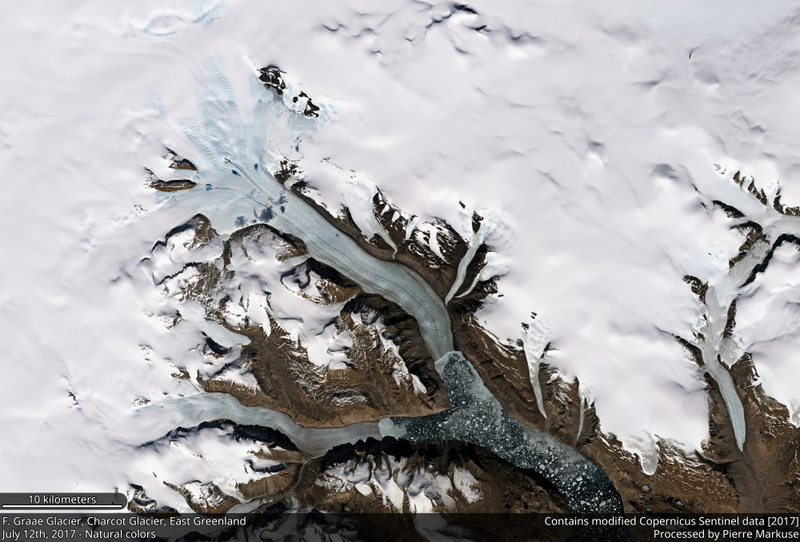 A beautiful view of the F. Graae Glacier and the Charcot Glacier in Greenland on July 12th in this Sentinel-2A image. Here we have an October 17th Sentinel-3 image of Hurricane Ophelia, shown with enhanced contrast. 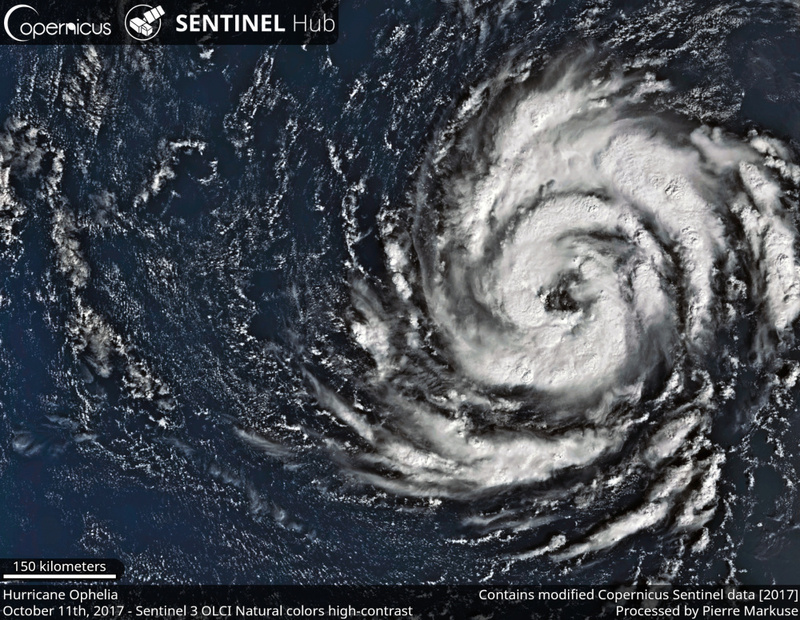 You should also take a look at this blog post about a Sentinel-2 image of Hurricane Jose. 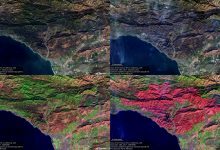 Three more Sentinel-2 images of the Thomas Fire in California, USA. You can see the massive fires as well as the burn scar and even some of the fire retardant dropped from air by helicopters and planes. More images of the Thomas Fire can be found in this album on Flickr. 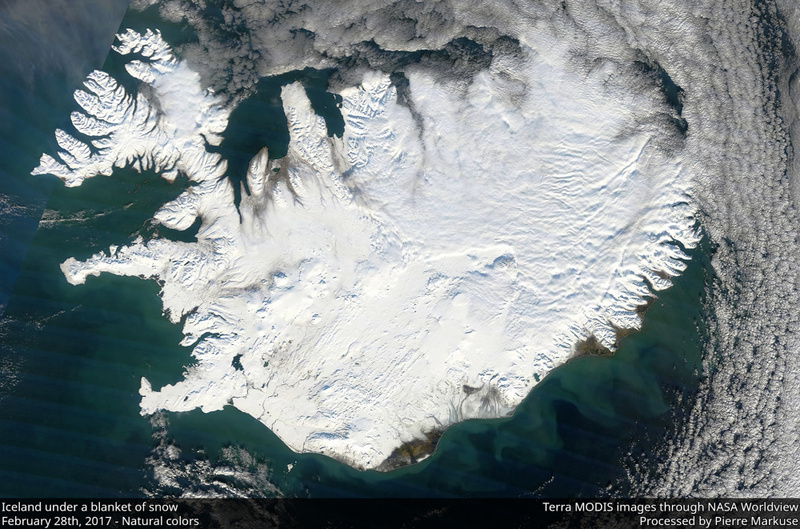 A beautiful image of Iceland under a blanket of snow, taken by the MODIS instrument aboard the Terra satellite on February 28th. 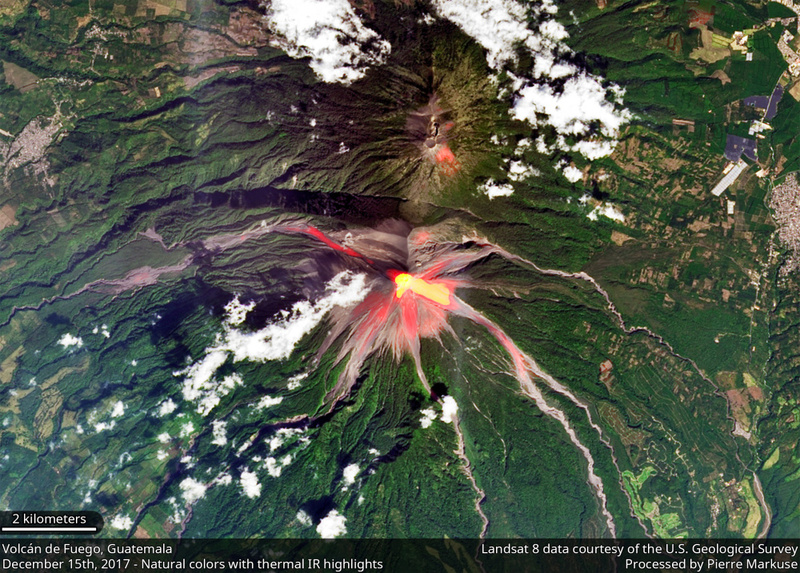 A Landsat 8 image of the Volcán de Fuego in Guatemala, combining natural colors with thermal infrared highlights, taken on December 15th. 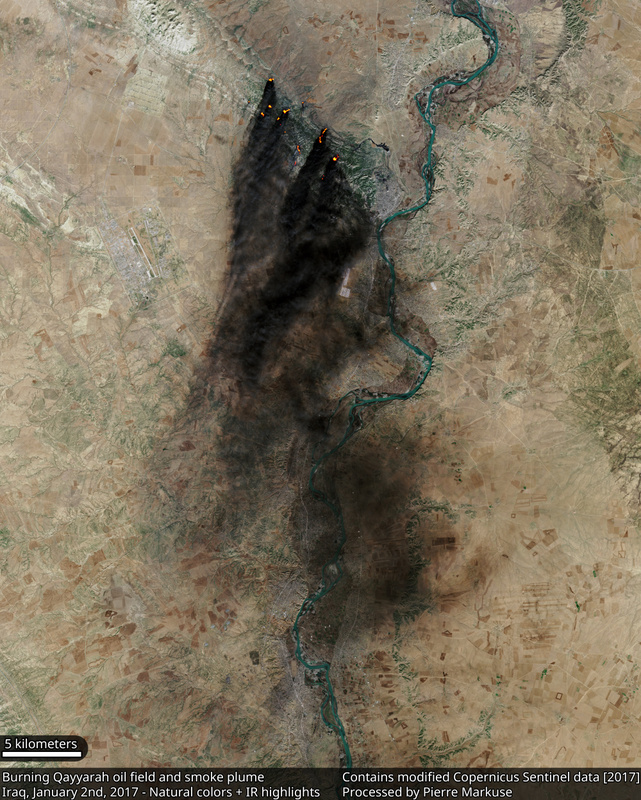 In this image we can see the burning Qayyarah oil field and the smoke plume the fires are generating as seen by Sentinel-2A on January 2nd. An animation alternating between a natural color view and a NIR/SWIR view can be found here on YouTube. 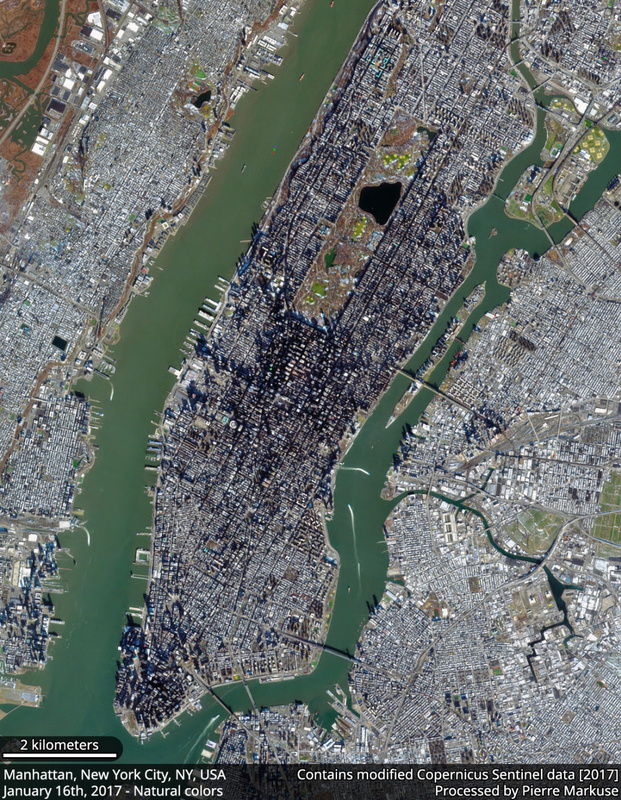 An early January (16th) image of Manhattan, New York City, as seen by Sentinel-2A. 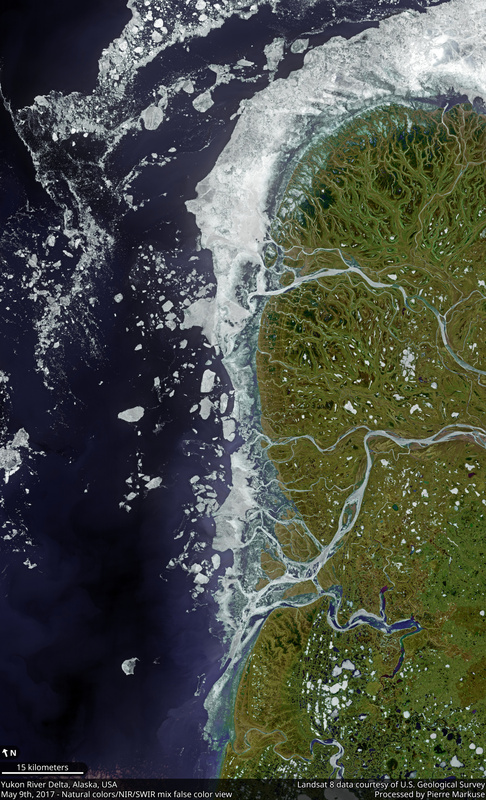 A false color image of the massive Yukon River delta in Alaska, USA, as seen by Landsat 8 on May 9th. 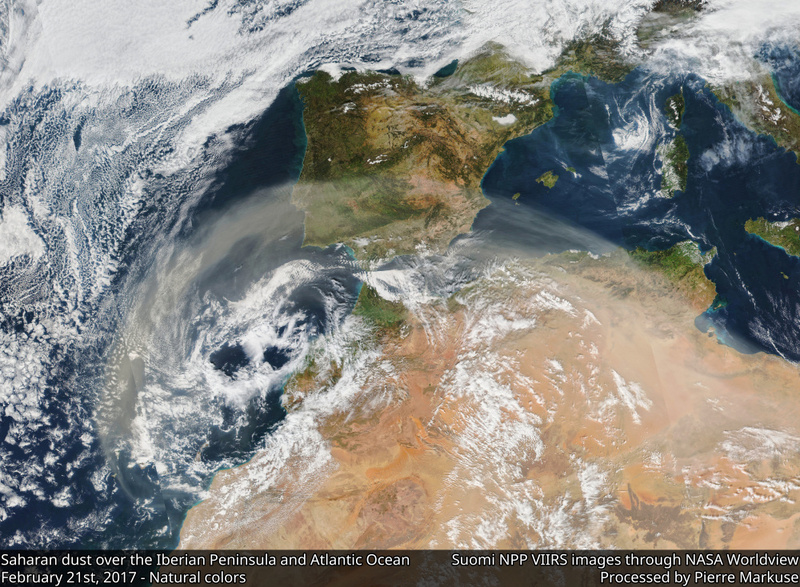 Saharan dust over the Iberian Peninsula and the Atlantic Ocean can be seen in this image taken by the VIIRS instrument aboard the Suomi NPP satellite on February 21st. 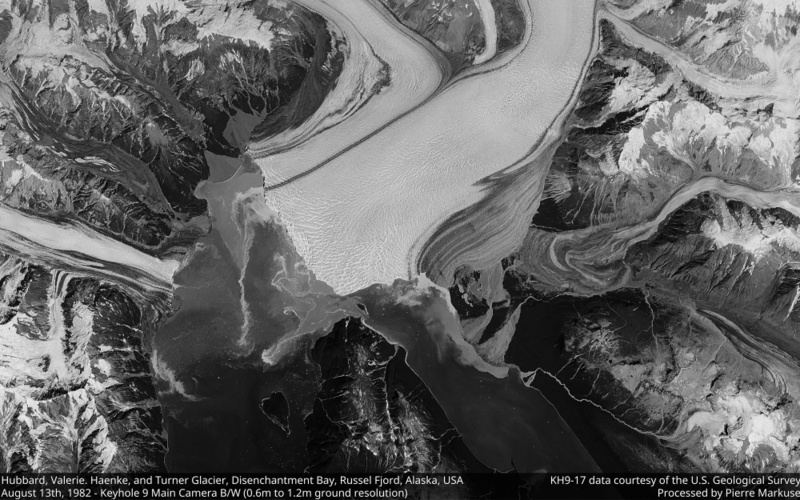 In this image you can see the Hubbard, Valerie, Haenke, and Turner Glacier, Disenchantment Bay and Russel Fjord in Alaska, USA. It is not really a 2017 image, but I processed it this year. It was taken on August 13th, 1982, by the KH9-17 reconnaissance satellite. A tool, created for spying during the cold war, which also took spectacular images of things which weren’t cold-war related. Images by many older of those spy satellites are being declassified on a regular basis and made available to the public. 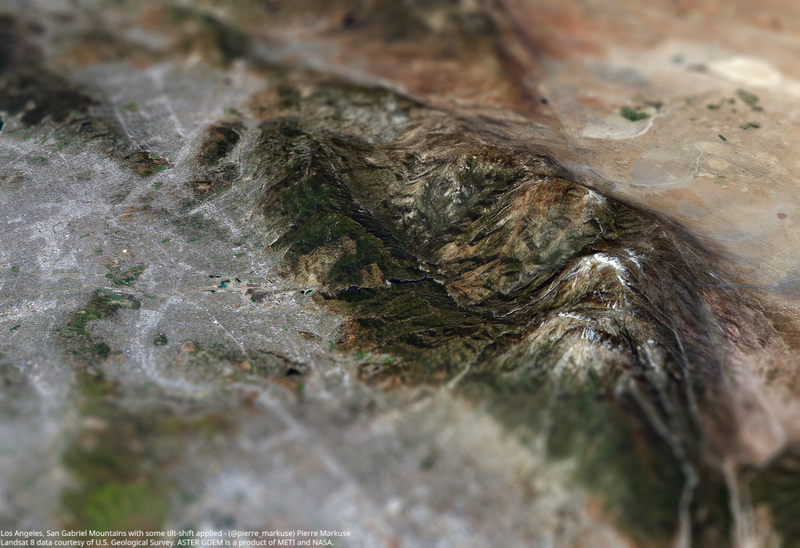 Make sure to click it and have a look at the full-resolution version (744 MP!) on Flickr, it is spectacular! 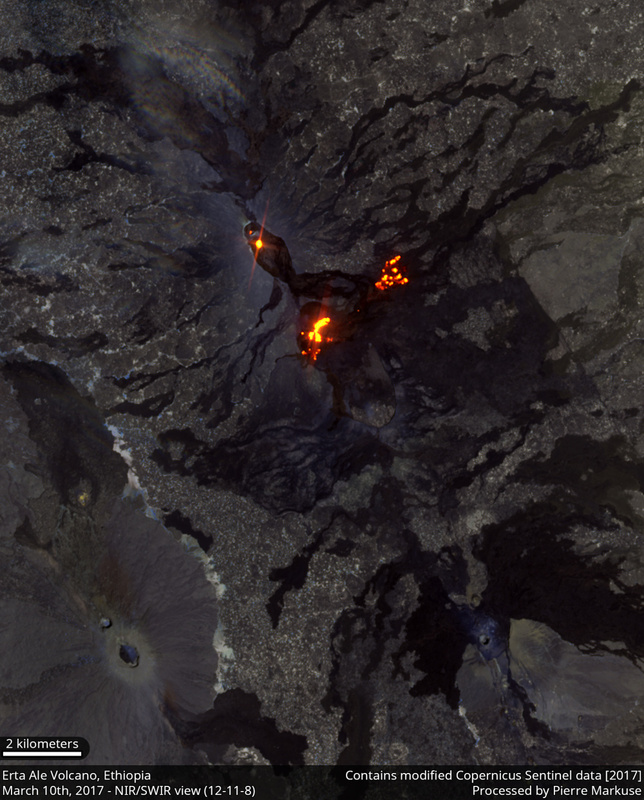 A March 10th image of the Erta Ale Volcano in Ethiopia as seen by Sentinel-2A in NIR/SWIR wavelengths, showing hot spots. 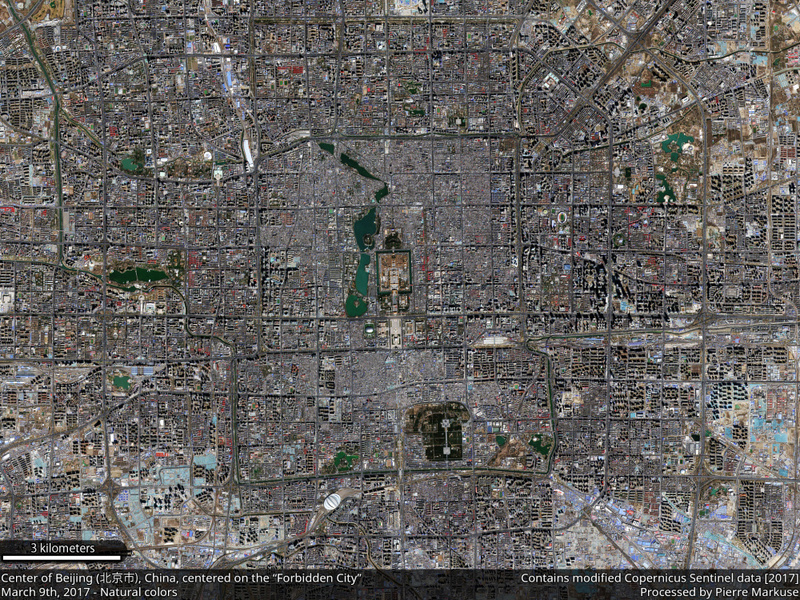 Here we have a March 9th Sentinel-2A image of Beijing in China, centered on the Forbidden City. 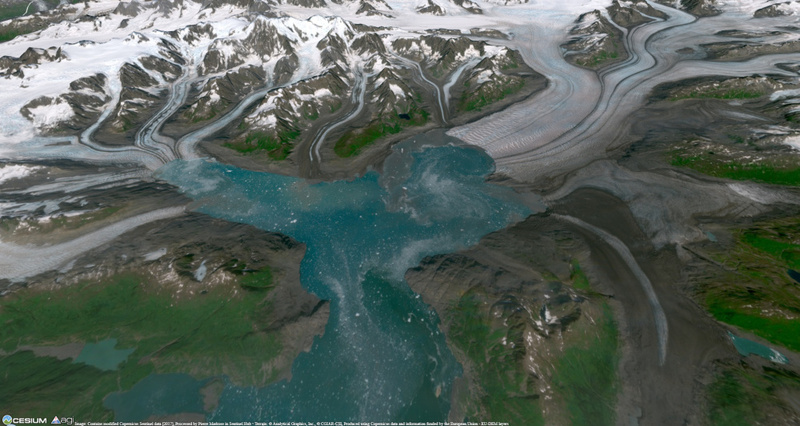 A quite beautiful 3D image of the Columbia Glacier in Alaska in August 2017. Terrain: © Analytical Graphics, Inc., © CGIAR-CSI, Produced using modified Copernicus Sentinel data and information funded by the European Union – EU-DEM layers. 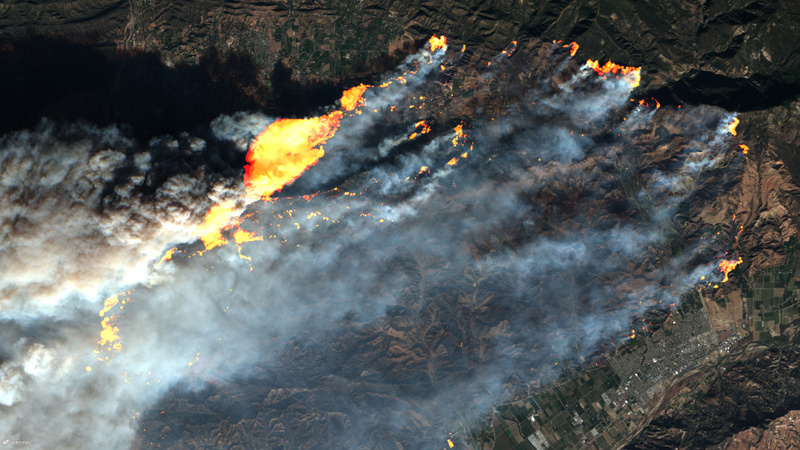 A July 4th Sentinel-2A image of the Burro Fire in Arizona, USA. 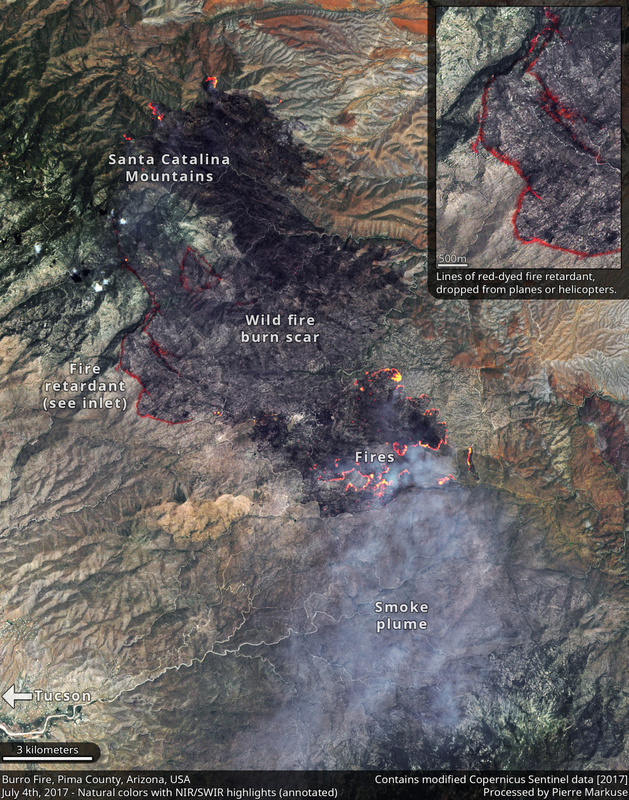 It is a beautiful example of what you can see in a satellite image during a wildfire, it shows some active fires, the smoke plume those fires generate, the burn scar caused by the fires, and even the red fire retardant used to control and slow the spread of the fires. 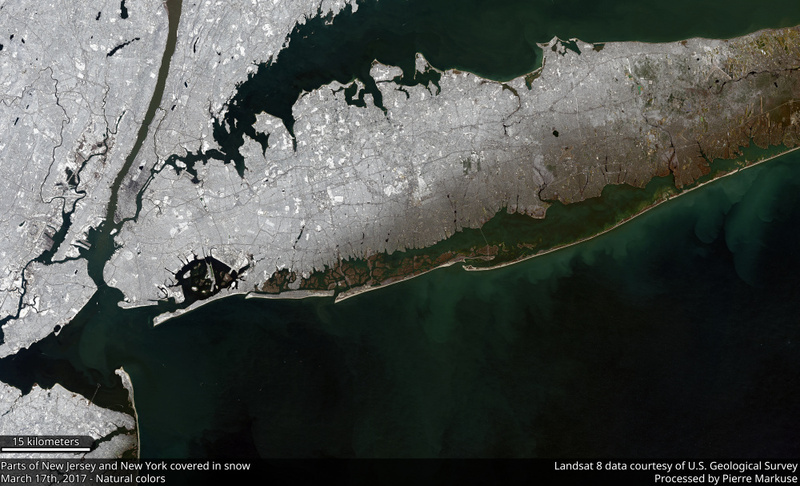 Two March 17th images showing parts of Ney York and New Jersey, the first one by Sentinel-2A focusing on Manhattan, the second one by Landsat 8 showing a bigger area, also showing some differences in the snow cover of Long Island. An April 22nd, 2017, 3D NIR/SWIR view of the 2016 Sand Fire burn scar in California, USA. 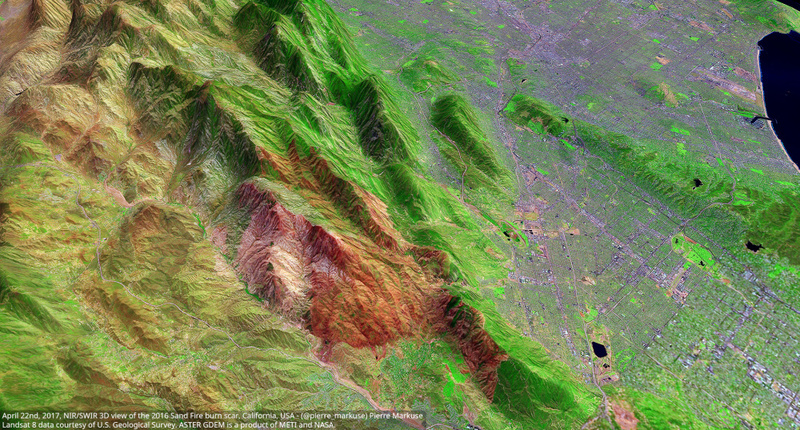 Made from Landsat 8 and ASTER GDEM data. 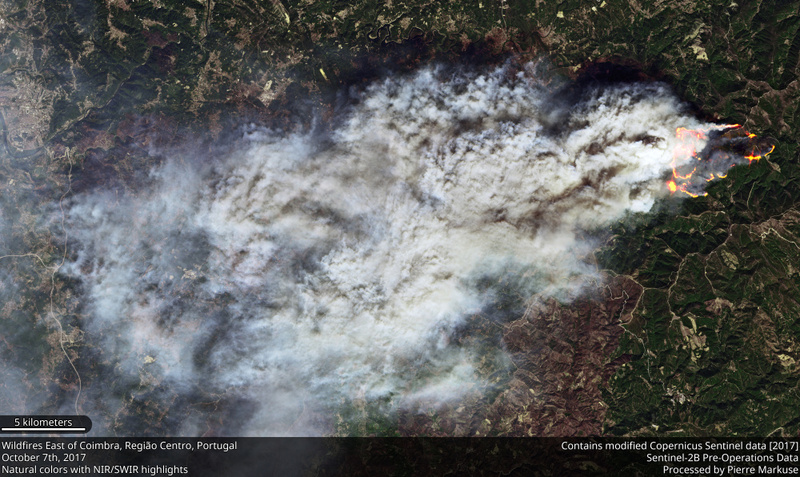 This October 7th Sentinel-2B image is showing a wildfire east of Coimbra in Portugal. 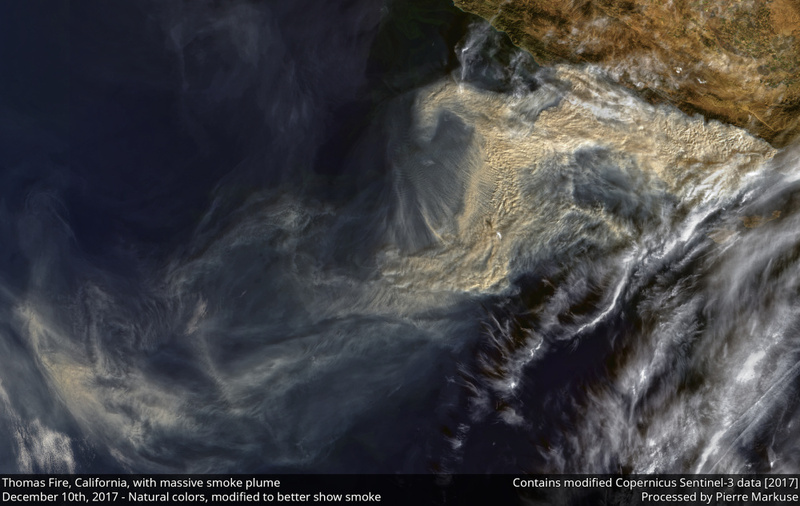 Portugal as well as Spain had some severe wildfires in this season. 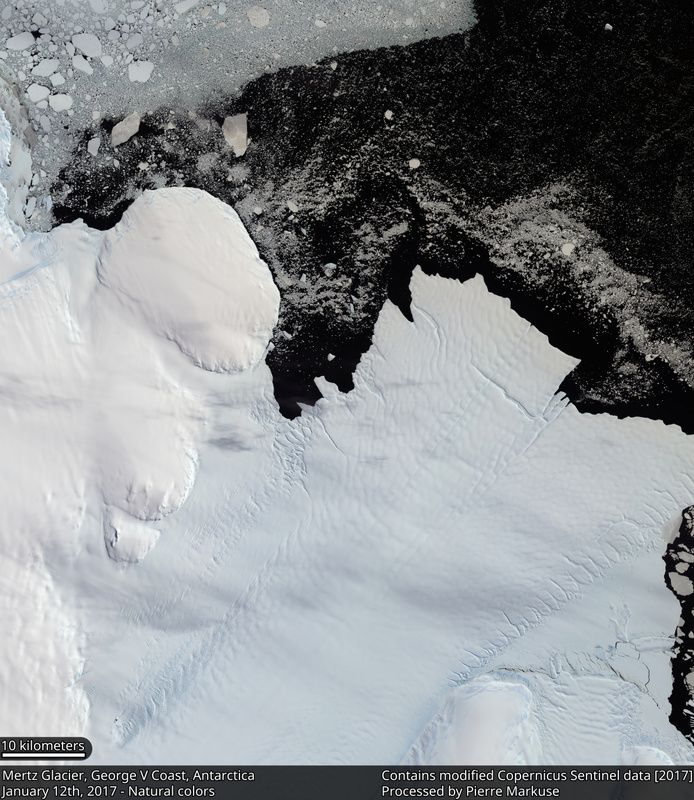 A January 12th Sentinel-2A image of the Mertz Glacier, George V Coast, Antarctica. Make sure to click it and have a look at the full-size image on Flickr. 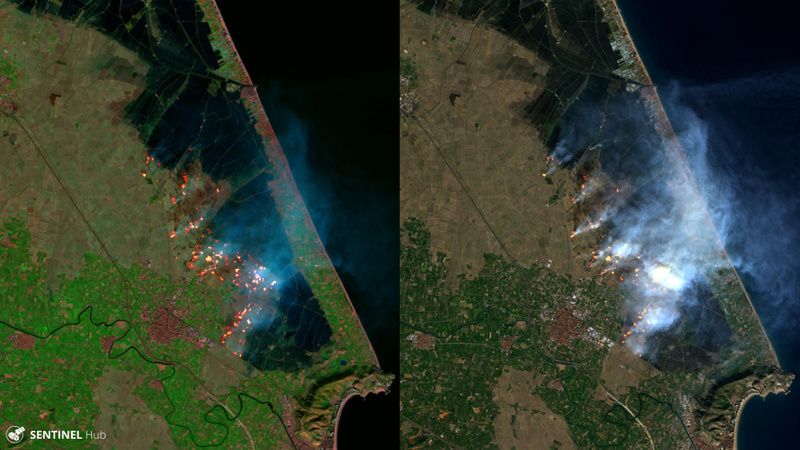 Two different views of rice straw burning near Valencia, Spain, as seen by Sentinel-2 on November 17th. Left a NIR/SWIR view, on the right a more natural colored view with only a little NIR/SWIR mixed in, as well as NIR/SWIR highlights. First spotted by Jorge García. 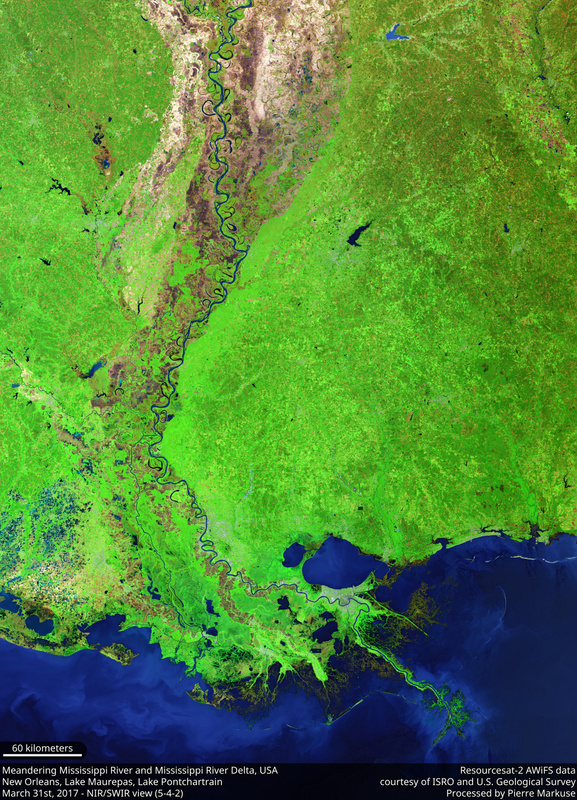 In this March 31st NIR/SWIR image, taken by the Indian Resourcesat-2 satellite, you can see the meandering Mississippi River and the Mississippi River delta. 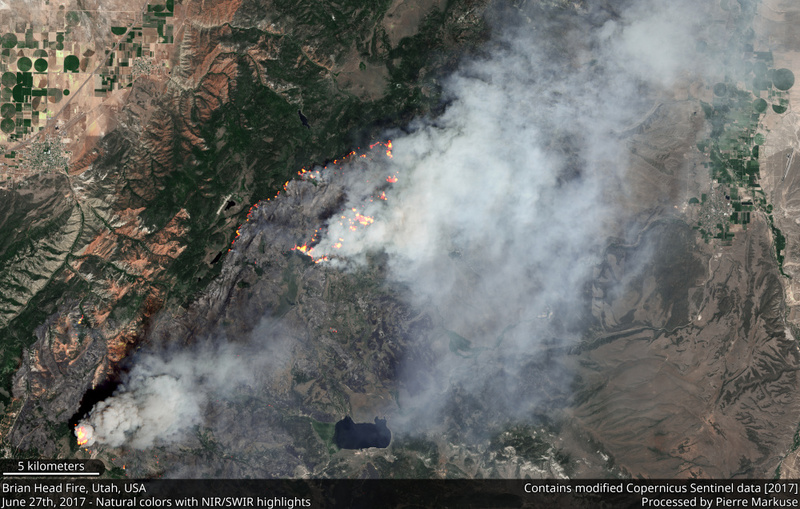 A June 27th Sentinel-2A image of the Brian Head Fire in Utah, USA. 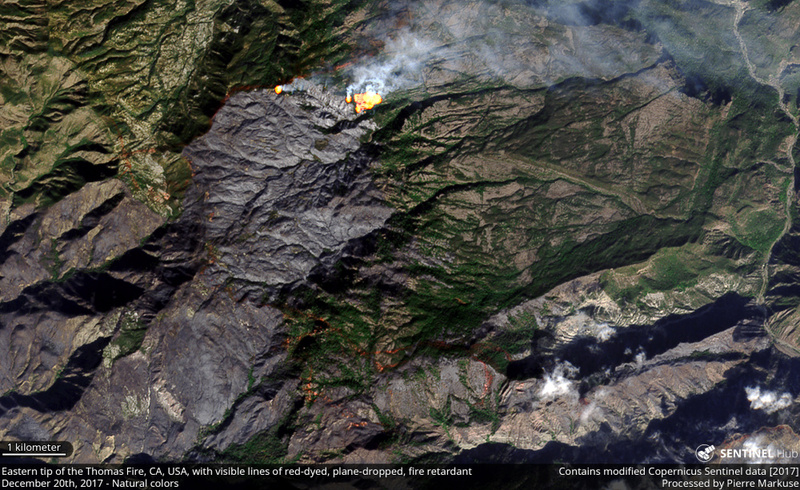 See the many hot spots (active fires) spreading and the difference between the healthy vegetation and the burn scar. 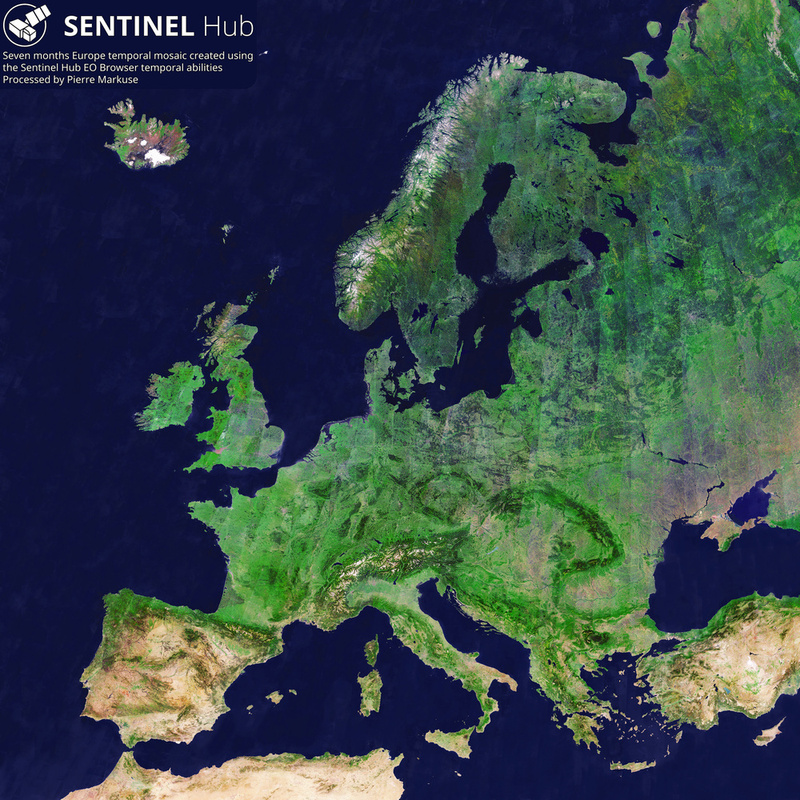 A temporal mosaic of Europe, made possible by the Sentinel Hub EO Browser and some help of the fantastic team at Sentinel Hub. You can read more about the image here in this blog post. I encourage you to try the EO Browser, its custom scripting is a powerful tool when it comes to analyzing and visualizing satellite data. Since you have made it this far, here as a little extra some animations I made of different glaciers in Greenland. Image source are the Sentinel-2 satellites. I went through the data using the Sentinel Hub EO Browser to find suitable and somewhat cloud-free acquisitions I could then use to create the animations. A full-size animated GIF of this video can be downloaded here. In case you would like to see even more images, you can find them here on my Flickr. 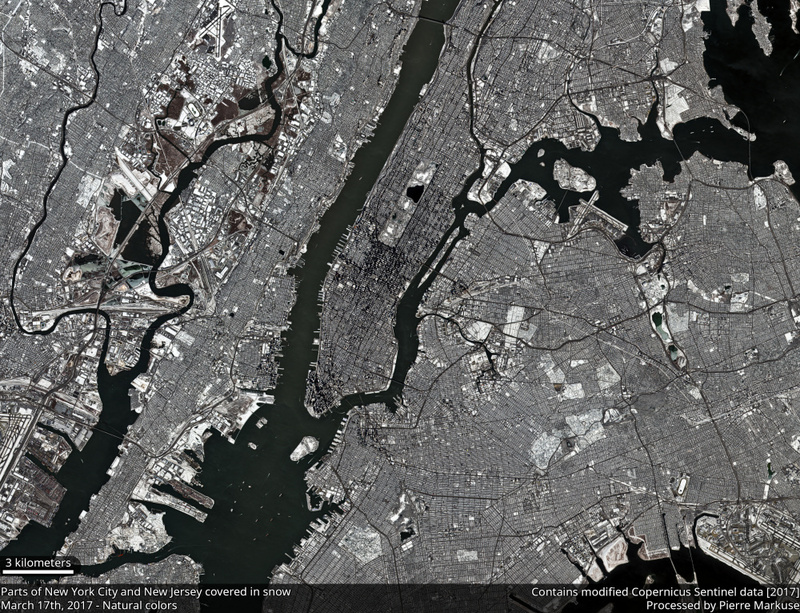 I would also like to thank all of you who shared my satellite images on Twitter (Not yet following me on Twitter? Change it here) or other social media in 2017 and those who gave me ideas, advice, or feedback. To all of you a Happy New Year 2018! Wanna give it a try yourself? If you would like to give satellite imagery a try yourself, the already mentioned EO Browser made by Sentinel Hub is a good place to start and get quick results. You might also want to try out some of the excellent (and free) tools Remote Pixel by Vincent Sarago has to offer, especially the Remote Pixel viewer. Have fun exploring Earth!